Increased drilling activity by national oil companies is boosting rig utilization rates, particularly for local drilling contractors. 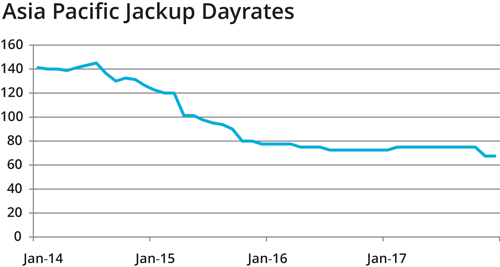 Continued oversupply will limit potential for dayrate improvement, likely through 2018; more rig scrappings are need to achieve a balanced market. 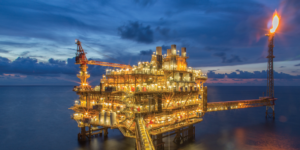 Drilling contractors are increasingly being asked to provide more services at the rig site, but companies must consider additional risk vs potential rewards. UMW’s NAGA 8, like the company’s other six jackups, is working in Malaysia. Over the past year, the company has reactivated five of its seven rigs, demonstrating an increase in rig demand. Compared with the approximately 20% utilization UMW saw in 2016, utilization in 2017 topped 90% and is expected to remain relatively unchanged this year. Much of the work that is being awarded in this region are short-term programs that are not in continuation. This means that rigs are still frequently going idle for short periods of time, even though overall there has been more work to go around. Local drilling contractors have also been seeing higher fleet utilizations over the past few months, another indication that the market is tightening. National oil companies in the region typically give preference to their local drilling companies, so it makes sense that local drillers would see improvements in rig utilizations before other companies do. 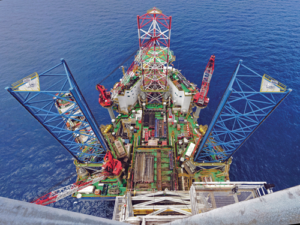 Jackups saw 63% utilization in 2017 on a total rig basis, which includes cold-stacked rigs but excludes newbuilds under construction, according to Clarksons Platou Asia. That compares with 50% utilization a year ago. 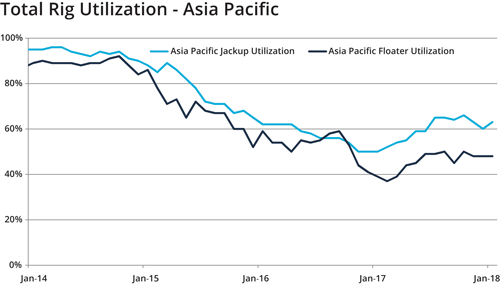 Floater utilization also crawled upward, reaching 48% in 2017, compared with 39% in 2016. Another positive sign can be seen in contract lengths for jackups, which averaged 216 days in 2017 versus 187 days in 2016. “2017 has had a nice mix of one year-plus contracts, mixed with short well-based contracts,” Morten Haugan, Managing Director of Offshore Rigs for Clarksons, said. Although contract lengths for floaters did not fare as well – the average dipped to 93 days last year versus 136 in 2016, Mr Haugan noted his optimism for seeing upward movement this year. “I would not be surprised to see contract lengths edge higher in both markets based on tendering activity. We may see several one- to two-year opportunities for jackups and six- to 12-month opportunities for floaters,” he said. Despite these encouraging signals, dayrates still have yet to budge and are unlikely to rise much this year. 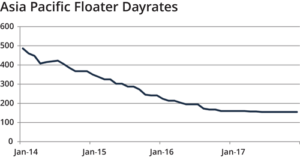 Floater dayrates remain between $120,000 to $170,000, similar to year-ago levels, and modern jackups are commanding only $50,000 to $70,000/day, also relatively unchanged from 2016. “Significant jackup supply in the region limits the potential for dayrate improvement,” Mr Haugan said, noting that the industry still requires more rig retirements than what have transpired over the past couple of years before the market will balance out. Worldwide, the industry scrapped 29 floaters in 2017, four of which came from the Asia Pacific. Eleven jackups were retired in the same year, with two of them coming from this region. On the other end of the pipeline, a whopping 83 newbuilds are on the books for potential delivery this year. Of course, “actual deliveries will depend on market strength and access to financing,” Mr Haugan said, although he pointed to at least seven firm jackup deliveries and up to four firm floater deliveries. In 2016, 22 newbuilds were delivered, 10 of which remained in Asia Pacific. In 2017, 17 rigs were delivered, with only five staying in the region. 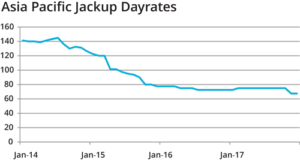 In 2017, jackup dayrates remained between $50,000 to $70,000/day, similar to 2016 levels. Over the past year, UMW reactivated five of its seven rigs, mostly during the summer season when operators prefer to drill because they don’t have to worry about monsoons. 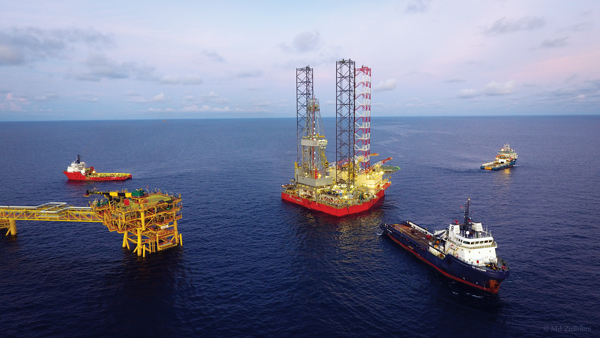 All seven UMW rigs are currently working in Malaysia, primarily for Petronas but also for Repsol and Hess. The company also anticipates starting operations for ConocoPhillips in Q2 this year, also in Malaysia. The UMW NAGA 4 will drill two firm wells with an option for two additional wells. 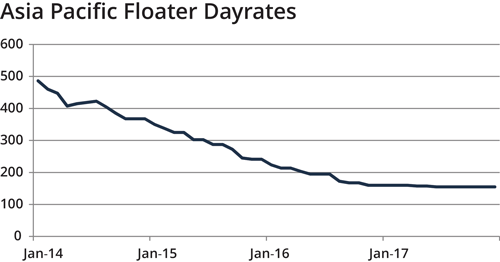 Floater dayrates have also remained close to 2016 levels, hovering between $120,000 to $170,000. In fact, unless something changes, it will become very hard for drilling contractors to sustain their businesses under the current dayrate model. “We really need to look at how we do business,” he said, noting that cost reductions for drilling contractors have already been so deep that any further cuts will start impacting performance and sustainability. And if drilling contractors can’t grow the pie anymore because of restrictions on well costs, they may need to go out and find a new pie. 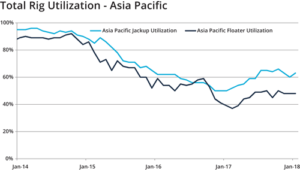 Total rig utilization in the Asia Pacific is beginning to trend upwards slightly, with jackup utilization growing from 50% to 63%. Floater utilization rose from 39% to 48%. UMW’s Head of Operations Izwan Megat (right) said he believes 2018 will be a busy year for the company. 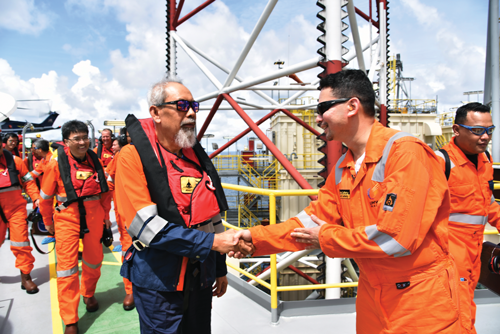 All seven UMW rigs are working in Malaysia, primarily for Petronas but also for Repsol and Hess. The company also anticipates starting operations for ConocoPhillips in Q2 this year, also in Malaysia. Vantage recently took its Platinum Explorer drillship out of warm stack to work for ONGC in India on a three-year field development program. 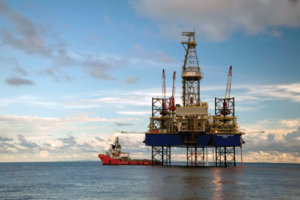 Its Topaz Driller jackup drilled three extended-reach wells for Ophir Energy in Thailand in 2017 before moving on to a new contract in Indonesia with a subsidiary of Petronas, PC Ketapang. It was recently announced that, after completing its program in Indonesia in early 2018, the Topaz Driller will mobilize to Cameroon in West Africa to work for New Age Cameroon. The third rig that Vantage has in the region – the Aquamarine Driller jackup – has been drilling development wells since late 2015 for Carigali-PTTEPI Operating Co (CPOC) in the joint development area between Malaysia and Thailand. Although that contract concluded at the end of January 2018, Vantage recently announced a letter of award for a new 18-month contract with CPOC, with four options of three months each, to continue drilling in the same area for Phase 4 of the development drilling campaign. Work will be carried out in Blocks B-17, C-19 and B-17-01. Vantage Drilling’s Topaz Driller jackup drilled three extended-reach wells for Ophir Energy in Thailand in 2017 before moving on to a new work program in Indonesia with PC Ketapang, a subsidiary of Petronas. experienced contractor with a proven operational and safety tack record, such as Vantage,” he added. Thailand and Myanmar will remain key focus areas for PTTEP in the coming year, said Chayong Borisuitsawat, Acting Executive Vice President, Operations Support Group for the Thai NOC. The operator drilled 250 wells in 2017, and this year is planning to drill 280 wells – 250 in Thailand and 30 in Myanmar. 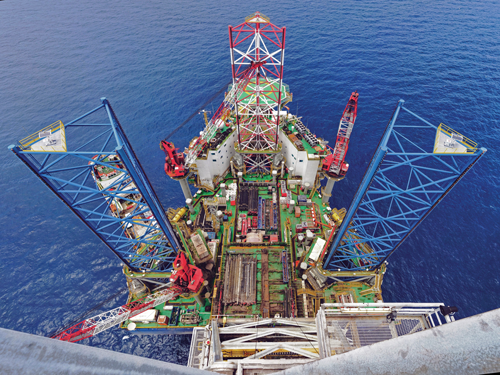 Vantage Drilling’s Aquamarine Driller jackup has been drilling for CPOC in the joint development area between Malaysia and Thailand since late 2015. Although that contract ended in January 2018, Vantage recently won a new 18-month contract with CPOC to continue drilling in the same area. rigs moving into Thailand to be able to do offline work. For operations in all regions, the operator kept 10 rigs contracted in 2017 and expects that number to remain unchanged this year. In addition to Myanmar and Thailand, PTTEP may also move forward with one exploration well in Malaysia and one in Australia. PTTEP’s total spend for drilling activities in all projects in 2018 is estimated at $1.07 billion. “The main challenge right now is how we can work with our drilling contractors to overcome the difficulties of the current market,” Mr Borisuitsawat said, noting that safety, security, health and environment (SSHE) remain core focus areas in PTTEP’s engagement with its contractors. For his part, he encourages contractors to develop competency for their personnel and improve SSHE practices in the workplace to eliminate undesired impacts. He also expressed concerns with how contractors can attract competent personnel as they start to reactivate rigs, especially in light of how much talent has already been let go during this downturn. Adoption of digital technologies is also being prioritized, he said, as PTTEP considers what infrastructure investments are needed to digitalize its producing fields. Collaboration with contractors will also be important to ensure that “we can go at the same pace,” he said. 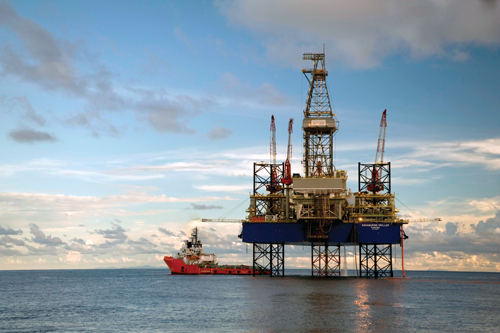 Shell Integrated Gas Thailand and Thai Energy Company, both affiliates of Royal Dutch Shell, have agreed to sell their 22.2% interest in the Bongkot field (pictured) and adjoining acreage offshore Thailand to PTTEP. The transaction is expected to complete in Q2 2018. The agreement is for Shell’s stake in Blocks 15, 16 and 17 and Block G12/48. Following the completion of this transaction, PTTEP’s stake in Bongkot will increase to 66.67%, with the remaining 33.3% owned by Total. On PTTEP’s side, cost reduction initiatives are still taking center stage through its Spend Smart campaign. “It is allowing us to save costs by having more collaboration between the asset management team and the drilling team. We’re now planning almost two years ahead, and that’s allowing us to find areas where we can have more optimization and to take advantage of economies of scale,” Mr Borisuitsawat said, adding that cost optimization initiatives are also ongoing on the procurement side. DC Editorial Coordinator Eva Vigh contributed to this article. Eva Vigh holds a bachelor’s degree in agricultural communications and journalism from Texas A&M University. Eva has been writing for Drilling Contractor since 2017.